The long sandy beach of Skilandari is a continuation of the beach of Ai. Sostis and stretches all the way to the start of Porto Beach. As is the case with the Ai. Sostis section, Skilandari too is an excellent beach for children, with a nice shallow, sandy bottom. Several sections of the beach have lounges and umbrellas to rent, and there are a few tavernas for lunch and dinner, plus a well-stocked mini market. 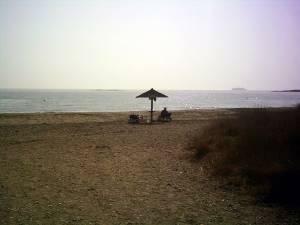 The view looks across to Mykonos, and the entire beach has been an award winner for many years. Parking is now practically non-existent, so it’s best to park at the end of Porto Beach (the terminus for the public bus from town) and take the lovely, short walk back along its beachfront to reach Skilandari.